GCSE results day 2018: what to expect - Which? Collecting your GCSE results is probably the first time you’ve received official academic results in person. So what can you expect (and what if things don't quite go to plan)? Can't collect your GCSE results? GCSE results day 2018 is on Thursday 23 August. Try your best to not worry too much about results day as it approaches. Eat normally and get plenty of sleep the night before. Be open with your parents about your upcoming results and any worries you may have – they’re there to help! Confirm what time your school will open on the day itself. Your school should have told you this before you broke up for the summer, but you can always check this on their official website (or even social media channels). If you can't make it in to school to collect yours, see what you need to do, below. Finally, spare a thought for whether you'd prefer to collect and open your results with your parent(s), in a group of friends for moral support, or perhaps just on your own. Make sure your phone is charged so you can call your family and friends once you receive your results (as well as take some celebration photos and share your good news with the rest of the world on Facebook, Instagam, Snapchat etc.). Your phone's calculator can also come in handy to add up marks and grade boundaries – another reason to make sure it's fully charged. Take some photo identification just in case, though it should be a teacher or someone who knows you well who'll be handing you your results. Remember that most of your school's building will be closed off to you for the summer, so you won't be able to hunt around for equipment. You can either open your results alone, with your family or with your friends – it’s completely up to you! If you want to open your results with as few people around you as possible, go into school early. If you go in later, there will be more people hanging around who've already collected their results. GCSEs have been undergoing some significant changes and these will continue. Last year, English literature, English language and maths were the first subjects to be graded on the new 9-1 structure (replacing the traditional A*-G system). This year a further group of subjects will move over to this new system, including the sciences, geography and history. Our infographic below highlights what the new grades translate to, but you can read more about the changes to GCSEs here. English and maths: you should obtain at least a grade 4 or 5 (formerly a grade C) in these subjects no matter what your future plans are. Colleges and sixth forms look for these as a basic requirement to continue your studies with them and universities typically have minimum English and maths requirements, whatever subject you're taking. Employers – be that for a part-time job now, or a full-time job several years later – may also ask for these. The subjects you want to carry on studying: similarly, it's important to meet any grade requirements you've been set for the subjects you've chosen to study at a higher level. 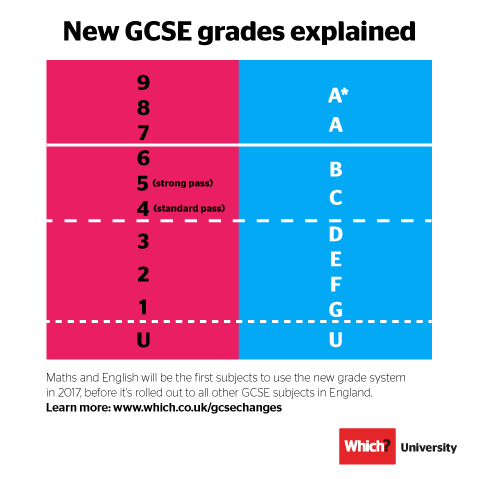 University applications: with A-levels changing recently too, universities could look more closely at your GCSE grades when deciding to offer you a place (for some students, these may be the last set of formal exam results available). Plus, depending on your chosen course, you may have GCSE entry requirements to meet too. Didn't get the GCSE grades you hoped for? If you don’t achieve at least a grade 4 or 5 (formerly a C) in your maths and English GCSEs, you’ll have to resit these to proceed to A-level (or other) study. Resits for these can be taken in November so you can rectify this one quite quickly. Retakes for other subjects take place the following summer. You may be allowed to proceed with your A-levels and take a resit while you do so (although this will be up to your sixth form or college to decide, based on your grades and other factors). Remember, you'll need to be fully committed to juggling the extra study and exams. Which? found that seventy-five per cent incorrectly believed they weren't entitled to further action if they felt they had been unfairly graded on an exam. If you want to query a grade – perhaps one is unusually low compared with others and you weren’t expecting this, or you’ve narrowly missed a grade boundary – speak to your teacher in the subject or a head of year. They can contact the necessary exam body on your behalf and an EAR (Enquiry About Results) can be made. Do this as soon as possible, ideally, on results day itself when you pick up your results. If reviewing your exam doesn’t lead to anything, you can still retake it. If you needed certain grades to get into a college or sixth form and you missed these, speak to them as soon as possible to find out if they will still accept you. If they won't accept you to the original courses you applied to, find out about similar courses they offer. If you did better than expected in a particular GCSE subject, or you've since been rethinking your greater goals and ambitions, speak to your college or sixth form as soon as possible to see if switching A-level subjects is possible. Provided you meet the entry requirements, there are still spaces on those courses and it doesn’t create any conflicts in your timetable, this shouldn’t be a problem. If you're not sure what you want to do, so-called 'facilitating' subjects – sciences, English, geography, history, maths or languages – typically allow you to keep your options open and progress into a wide array of subjects at a higher level. Our six-step plan to making A-level choices can help you make your decision. Need to rethink your A-levels? Use our tool to see where different combos will lead you. If your original college or sixth form won’t accept you to the courses you applied to and they don’t offer any similar courses you’re interested in, look around at other nearby institutions. These might have lower entry requirements or a wider range of courses to consider. BTECs are a viable alternative route to university if you can’t find an A-level course you’re happy with. In 2017, over 50,000 applicants applied to university with either BTECs alone or a combination of A-levels and BTECs. BTECs are typically assessed on an ongoing basis through a mixture of coursework and exams, removing the onus on end-of-year exams associated with A-levels. If you have a specific career in mind, there may also be alternatives to university study, including qualifications combined with on-the-job training, such as NVQs and apprenticeships. Ideally it's best to make sure you're around on results day, so you'll have the benefit of being able to speak to a teacher on the day if you need to. But we understand that sometimes this isn't possible due to family holidays and such. In this case, arrange for your school to post your results to you. If you're taking any Edexcel exam, you can ask to be registered on to its ResultsPlus Direct service to access your results online. You can also arrange with your school for a friend or family member to go in and collect your results for you. That person will need a signed letter from you authorising that you’re happy for them to collect your results on your behalf and a form of ID to verify who they are. So you have your GCSE results and you're beginning Year 12 soon, what now? Before then – and while you still have a few weeks of summer holiday left – use our A-level Explorer to check where your A-level choices will leave you two years from now. It might give you some early food for thought as to what you may want to study at university. You might find that you're not on the path you want to be on. Or maybe you didn't get the GCSEs you were hoping for and it's thrown your plans off. Luckily there could still be time to change your A-level choices (but you have to act fast!). Having just finished Year 12, Chloe gives us the lowdown on transitioning from GCSEs to A-levels, how she picked her subjects, what surprised her and more.